Even the most well-organized closets, when lacking doors, can give a room a cluttered appearance. Thus, if your closet does not have a door, you’ll need to come up with another way to cover the closet entrance. That way, what’s inside it stays out of view. Fortunately, there are several cute and relatively inexpensive ways to do this. Hiding a messy closet requires a door. Curtains provide a perfect cover for your closet entrance. Use a tension rod to hang pretty curtains from the frame of your door, or mount a decorative curtain rod above the door frame to hang the curtains from. 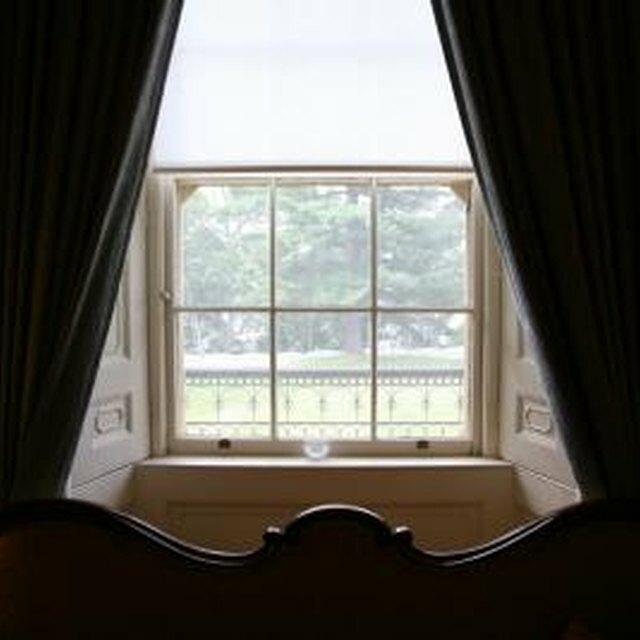 Choose curtains in a thick material and avoid sheet fabrics that allow visitors a peek at what’s behind them. Consider your decorating theme and the colors in your room to find a curtain that will blend in with the rest of the room. Make sure that the curtains reach all the way down to the floor. If not, you can make your own curtains easily by getting a piece of fabric slightly longer than the door and sewing a hem all around and hook eyes on the top edge. A slightly different take on curtains are cloth panels that reach from the ceiling to the floor and create a walkway into your bedroom. You’ll need two panels for this. Simply have fabric that matches your decor cut so that it’s slightly longer than the length between your ceiling and floor. Sew in a hem of each panel. At the bottom two corners of each panel, sew in or otherwise attach two small magnets or heavy buttons to weigh down the bottom of your panels. The top two corners should have hook eyes. Attach shelving hooks to your ceiling to hang the top of your panels from. They should create an L shape, so that you have to walk around them to get into — or see in — your closet. The panel that will hang parallel to the closet entryway should be 2 to 3 feet away from the entry — just far enough for you to walk by it comfortably. Folding screens come in a wide variety of colors, materials and sizes. Choose a folding screen that has at least two panels and is as tall as the door frame. Place the screen several feet in front of the closet entrance in an L shape to create a mini-hallway into your closet. This will make it difficult for visitors to see the closet entrance. At the same time however, you won’t have to move anything aside to get into the closet. Vinyl blinds installed on a doorway can make the entryway to a closet look like a long window. Take precise measurements of the closet door frame. Then, visit a home improvement store and custom order blinds that will reach from the top of the door all the way to the floor. When you need to get in and out of your closet, rather than opening and closing a door you’ll be pulling on the cord to lift your blinds. Keep the blinds closed so no one can peek at the clutter behind them.